Total distance on unpaved roads: 2071 km. In northern Kenya and South Sudan I had no other option but to ride on dirt tracks. 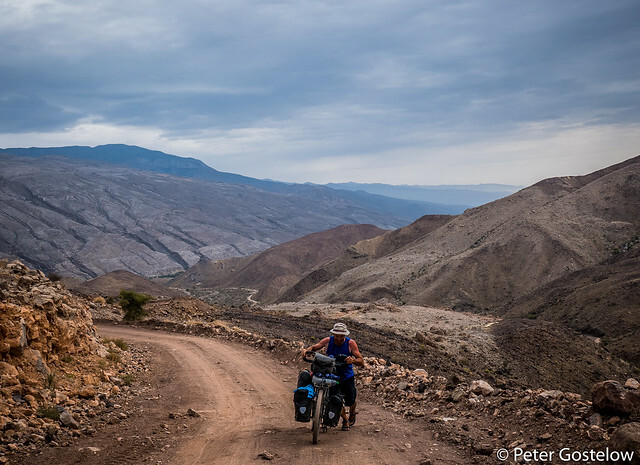 In other countries – Uganda, Ethiopia and Oman for example, I sometimes chose to take dirt tracks as a more adventurous/quieter alternative to the paved roads. Returning to Tanzania wasn’t in the original plan. This was, and remains, to ride north to Ethiopia and beyond. But the British Council, my former employer, needed an English teacher for a short-term contract in July. The job-spec sounded interesting. What would a 600km detour and 3 weeks off the road matter when I had no need to be any place at any particular time. I hadn’t expected the tears. After 2 years I was wheeling the bike out of the gate for the final time. Leaving Mwanza. Leaving familiarity. Leaving friends and the comforts of having my own place and space. What a luxury that had been. I knew I would miss it, but it was time to move on. Another year passes by on the roads of Africa; this one spent between the mountains of northern Cameroon and the tranquil shores of Lake Malawi. I managed a modest 12,000km of cycling – about the same as last year, and crossed through 8 countries. One of those new Chinese roads provided my exit from Kenya. There are a lot of these in Africa. In fact there probably isn’t a country on the continent that hasn’t had some Sino-African road-building agreement signed. Well Africa needs better roads, and the Chinese do a good a job at providing them. I think you could travel most of the length of Africa if you wanted to on Chinese built roads, but dirt tracks are always more interesting. I think it’s every traveller’s worst nightmare: to return to your room and find a thief has been inside. You locked your door when going out and now it’s open. Standing at the doorway you take stock of the bed and floor, which is now scattered with the contents of your bags. But of course it’s not all the contents. The thief does not want your clothes, your tool bag or your spare inner tubes. It is cash, cameras, laptop and any other item deemed valuable in the eyes of this crook. Well this particular crook did a good job. The only valuable item left in my room was my passport. Otherwise it was pretty much a clean sweep. Laptop and modem – gone, Nikon SLR camera with 2 lenses – gone, compact camera – gone, money belt containing credit card, £100+ cash and personal collection of African bank notes from every country I’ve been to – gone, Ipod and external mini speakers – gone, camera tripod – gone, solar battery charger – gone, tent poles (bizarrely enough) gone. But most significantly of all, far more valuable than electronic items that can be replaced, was my external hard-drive. This is the storage device that contains thousands of photos and videos of the trip. I had last backed up my photos in Nigeria, over 6 months ago, and was planning to do another back-up in Nairobi within a few weeks. And what of the bicycle? Well fortunately that was with me at the time. In actual fact I was still on the Guest House premises when the theft took place. Let me put this awful story into a much wider context. Then you’ll realize just how angry, frustrated, dumbfounded and emotional I am about it all. This is going to be quite a long blog post. Please bear with me. I was and still am as I sit here now, in the small town of Kapsabet, western Kenya. The region has a cool climate and is surrounded by rolling hills of tea plantations and forests. I came here for a specific purpose, which was to observe and assist in a distribution of 2500 mosquito nets for surrounding rural communities. Some of the nets had been funded from people pledging donations to The Big Africa Cycle. A small team of Catholic nuns from India who help run a maternity clinic in the town were conducting the distribution. The sisters had arranged for myself and four Spaniards, also to assist in the distribution, to be lodged in a comfortable Guest House close to the town. “We are choosing this place because it is quiet and secure” remarked Sister Mary, in her Tamil twang. And so it seemed at first. My room and the four for the Spanish were located in a separate annex – a one storey building located beside a freshly cut lawn where local Kenyans come to eat and drink. After a peaceful first night the four of us joined the sisters the next day, journeying through beautiful rolling pastures and tea plantations towards the edge of the Nandi escarpment. Several local Kenyans were alongside us, one of which plays a significant and unfortunate role in this whole story. Ken, a local from Kapsabet, had been asked by an American well wisher over the Internet (someone with a vested interest in malaria who had donated $1000 to buy bed-nets) to assist and observe in the distribution, as well as to collect and document what information he could about the incidence of malaria in the area around Kapsabet. For a man with qualifications and skills in IT it seemed a little strange, but Ken was educated, open, friendly and actively participated with an interest in the distribution. He had no camera and requested whether he could use some of my photos to forward to this American. Not a problem. I was willing to oblige. Monday passed and we all returned to our Guest House in the evening. Tuesday 5th July was a repeat. Breakfast early and off into the countryside with another 500 nets to distribute. Before leaving I’d given the key of my room to the guardian, a quiet young man who didn’t appear to speak any English. The floor was dirty and I gave him permission to enter and clean – nothing unusual there. The bed-net distribution finished early that day and we were back at the Guest House at 3pm. Ken said he would not be continuing with the distribution for the final two days as he needed to return to Eldoret, where his wife and children lived. I agreed he could take some of my photos as earlier requested, but to return to the Guest House at 4pm, after I had taken lunch with the Spanish. At 4pm I was back in my room, having received the key back from the guardian and noted the bed was made and the room clean. The Spanish left soon after to visit a nearby waterfall, but I decided to stay, partly through tiredness and partly because I’d told Ken he could come to take some photos. “Come and find me in room 3” I said on the phone when he arrived at the Guest House. He was still in my room 20 minutes later when I received a call from the Doctor at Nandi Hills Hospital. 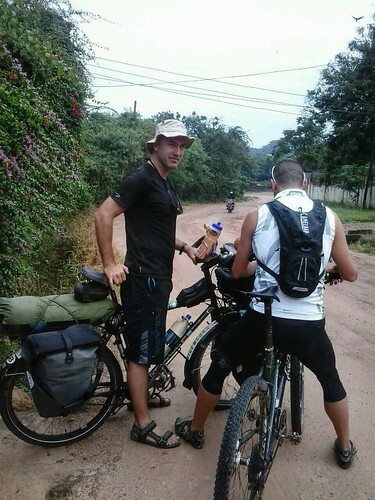 We had met and spoken the previous day about having the press covering a story about the bed-net distribution and my role in having cycled all the way from the UK. The Doctor was coordinating the press and now at 16.45 they were coming to the Guest House to conduct an interview. “Take your camera or laptop to show photos to the journalist”, suggested Ken before we left the room together and went to meet them at the entrance. It seemed a bit too much effort, for surely they would arrive with a photographer. I locked my door, put the key in my pocket and walked with Ken and the bicycle to the Guest House entrance, some 100 metres away. Ten minutes later a group of 5 of us, including Ken, were sat on a grassy area some 20 metres now from my room. For the next 30 minutes I talked about the hows and whys of riding a bicycle thousands of kilometers across a continent and my involvement with the bed-net distribtion. “Show them some of your photos”, Ken remarked again during this conversation. But no-one had brought any laptop or digital storage device so the matter was dropped. “How can we read more about the journey”, asked one of the journalists. I started to write the website down, but decided it would be more professional to hand them a card. So I dashed back to my room. And that is when I noticed the door open and everything gone. The shock at what took place between 1700-17.45 on Tuesday 5th July at the inaptly named ‘Steve Nice Guest House’ in Kapsabet, was joined by anger, disbelief and frustration at how the response and investigation was conducted. Theft and robbery is a common occurrence in Kenya, and perhaps one should not dwell too much on the loss of one’s valuables, but when action is not taken to incriminate those who are clearly guilty you feel justice must surely prevail. My spirits have been at an all-time low since the robbery. It wasn’t just my room that had been opened with a spare key, but every other room. When the Spaniards returned an hour after the theft had taken place they too found their locked rooms had been opened and whatever valuables they had not taken with them to the waterfalls had been stolen too. What surprised me at first was the slowness of the management to respond. No-one came forward to offer an apology. Lips sealed. Not even a sign of shock. The guardian responsible for the keys stood like a deaf mute as I asked where he was when this took place and where his keys were. The owner’s son soon started covering for him, switched to the local dialect and when the police finally arrived all blame was pointed at Ken, saying he was present when the theft took place. “How well do you know this Ken character”? asked police and locals with an inquisitive interest in what was taking place on their turf. Of course when I said I’d met him the day before eye brows were raised. Even the Doctor came down to the Guest House and said Ken was where the blame needed to be pointed. Had I really been duped? Moments earlier I’d told journalists that I’d met so many people on this trip that I valued my judge of character to be very high. Could Ken really have tricked me somehow? There were some things that seemed odd. Why would a man involved with IT attach himself to a bed-net distribution organized by Catholic Missionaries? Why was he leaving that same day from Kapsabet? Ken, the guardian of the Guest House, the manager and assistant manager were taken suspect by the police. When I gave my statement along with the Spanish the next morning it was with the belief that Ken had been at the centre of this. The day passed. Another distribution of mosquito nets was taking place and I broke down in tears when the local chief asked me to introduce myself and why I was here. It has not been the only time I’ve cried in the past week. Later that day I heard the three Guest house employees had been released by the Police, but Ken was being held as a prime suspect. It was then I started to think about the whole day again. Ken had told me the waterfalls were not really worth going out of my way to see. It is part of the reason I let the Spanish go without me. And he’d also suggested showing the journalists my photos from the camera and laptop. This is at a time when the theft could still have been taking place. Not once during the moment I left the room with Ken and locked my door to when I returned 40 minutes later to find it open and robbed had Ken used his mobile phone. He had been alongside me all along. It was then that I realized that Ken was being framed by the police. A convenient scape-goat whilst the Guest house management were let off. This was an inside job. The spare keys had opened those doors and the questions needed to be directed to the guardian, where he was when the theft took place and where the keys were. I returned to the Police Station on Thursday, two days after the theft, and asked to speak with Ken alone. He confirmed what I had thought, and I apologized that I had not trusted my instincts about the guy. Whatever he may or may not have done in the past, this man was not guilty. An opportunist making a small sum of money from an American well-wisher who’d probably never before been in the country, yes, but a criminal tipping someone off to enter my room with spare keys, no. By this time I had lost whatever hope I’d ever had that the police were going to help me. Had someone at the Guest House paid the police off to have their 3 employees released and Ken used as a scapegoat? Quite possibly. I was wasting my time with the police, who told me they would ‘continue their investigation’. The incompetence of the Police was confirmed to me by a Korean woman, eccentric to put it mildly, who has been in the country long enough to know how things work. She suggested I contact the Mayor. Along with his team of councilors and elders we descended on the Guest House the following day, where the manager attempted to make lies up about Ken and his whereabouts at the time. The Mayor and the councilors were convinced like me that this was an inside job. The management of Steve Nice was responsible and if these things weren’t brought forward the license of the establishment would be removed. Accompanying the Mayor and his entourage was an elderly man who remained silent during this gathering of people. “This man will help recover your things” vowed the Mayor. “We’ve worked with him before”. When I asked how this frail old man would physically recover the valuables I was told “He can work miracles. Trust him. Something will happen now”. Well that was over a week ago as I write this now. My hopes were raised for a short period over the weekend when an independent team of investigators travelled from Nakuru to conduct their own findings. They departed with enough evidence to return to Kapsabet, arrest and take these 3 Guest House suspects away unless items were returned. In the words of the Mayor I had been assured that by Tuesday of the following week (12th July) things would be brought forward. “They cried with us to be given until Tuesday” stressed the Mayor. Well Tuesday passed, the Mayor was in Nairobi all week and nothing happened. Merely talk and no action. As a back-drop to all the telephone calls, conversations and banging-my-head-against-the-wall moments when people say they will call be back but never do, I have been staying with the Catholic nuns in the mission since the theft. The thief hadn’t even left me with 10 shillings. It’s an odd, but calm and safe place to rest my head and I’ve been made to feel very welcome. “Don’t worry Peter. God will take care of everything” repeats Sister Mary with that characteristic south Indian head waggle I remember so fondly from the sub-continent. I wish I had such faith. Had the theft been all valuables except my hard-drive I probably would have got over it by now. Cameras and laptops can somehow be replaced. But as I told the police, the Mayor, the press and the management of the Guest House, this hard-drive is invaluable and I’m willing to pay a far higher reward to get it back than it can be sold for on a black market. Still nothing. The miracle worker, who might well be dubbed a ‘witch doctor’, was called a second time yesterday. Just like the week previously, he, the Mayor and his entourage and myself headed to the Guest House. The Guest House staff present were assembled and a traditional prayer was voiced loudly in Kalenjin. At one stage he stripped to reveal a bony torso before pacing back and forwards thrashing a leafed twig through the air. I tried to keep a straight face. ‘Something will come from this weekend” assured Ken, who was present as well. He told me the same thing a week previously. I’m slowly coming to the realization, almost 2 weeks on, that what has happened happened. And worryingly the ease and speed with which it took place whilst I was metres away is a reminder that it could have happened in many other places. Just as I am here I’d be the helpless mzungu naively expecting justice to prevail, as any other westerner who has grown up in a World where law and order have some level of merit might do. I never planned nor wanted other people to somehow fund my trip, as I’ve seen others do from long-term journeys. But after almost 2 years on the road things are a bit desperate on the budget-for-the-trip side of things. If I’m to continue to blog, photograph and document the journey to its conclusion then finding a replacement laptop and camera is essential. Photography has always been integral to the trip. So if you’ve enjoyed reading this blog – newcomer to the adventure or a follower from the beginning, I’m asking you to contribute, if you can, something towards covering the cost of the stolen items. It is why you see this paypal donate button here. It is so easy to live a life that has been scripted for you by others, to fall into the mire of conformity by following a path that society has laid before you, rather than heeding your own unique calling. Comfort, complacency, routine, the path of least resistance, the easy road - these things are the bane of humankind. It is a disquieting moment when you awaken to realise the trappings of conventiality have created a life for you that is entirely different from the one you wish to live.